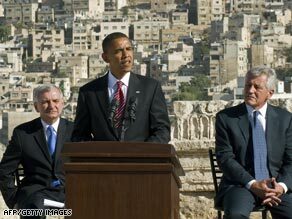 Jack Reed, left, and Chuck Hagel, right, joined Barack Obama in the Middle East. (CNN) - Two former military men who traveled to war zones with Sen. Barack Obama (D-Illinois) say the presumptive Democratic nominee is qualified to be commander in chief, despite his lack of military experience. Sens. Chuck Hagel (R-Nebraska) and Jack Reed (D-Rhode Island) spoke to media this morning in Washington after appearing on CBS’ "Face the Nation." The two accompanied Obama to the Middle East last week. Both Hagel and Reed spent years in the military. Reed attended West Point and retired as an Army captain, and Hagel earned two Purple Hearts fighting in the Vietnam War. Reed recounted the experience of traveling to military posts with Obama. Sen. John McCain (R-Arizona) has repeatedly questioned Obama’s stance on the war in Iraq, particularly his opposition to the surge of troops instituted over the past year. The presumptive Republican nominee addressed the topic again in a radio address yesterday. Reed and Hagel also addressed a new ad from the McCain campaign. The ad’s script says that Obama “made time to go to the gym, but cancelled a visit with wounded troops.” It continues, “Seems the Pentagon wouldn't allow him to bring cameras.” Both Hagel and Reed said the ad is inappropriate. “It is factually distorted, and it is I hope not a sign of things to come, because there are two many important problems to engage at this point in baseless insinuations about patriotism and about American men and women in uniform,” said Reed. Hagel, a Republican, has not endorsed either candidate, and he said Americans are fortunate to have a choice between McCain and Obama. “These are both smart men, they're capable men, they're decent men, and they love their country,” he said. I really feel that McCain still does not get it.He is constantly talking about winning and losing.It was and is the wrong war!It is time we start to worry about AMERICA and let Iraq take care of itself! McCain claimed he was going to run a clean campaign, but what are we seeing, all sort of lies and distortions from him. He is not an honest person! To all of us that supported HRC.. If HRC had won, and all Obama's supporters did not unite around her, could she have had clear shot.? If No, then the time has come not to forget, but to forgive, unite and also support the representative of our party, that has also been endorsed by HRC.. The stake is too high, the opportunities are enourmous.. Dem 08..